Lenny, Meg and Babe Magrath are three Southern sisters with very different personalities and lives who have just reunited due to unfortunate circumstances: Babe is out on bail after shooting her husband in the stomach. Crimes of the Heart is warm-hearted, irreverent, zany and brilliantly imaginative comedy – and it’s opening next at Asheville Community Theatre. The comedy will open at the downtown theatre on Friday, August 12 and run through Sunday, August 28, 2016 with performances on Friday and Saturday nights at 7:30 pm and Sunday afternoons at 2:30 pm. Tickets are available online, over the phone, or in person at the Asheville Community Theatre Box Office. In Crimes of the Heart, three young Mississippi sisters have reunited to support the youngest sister, who has just shot her husband in the stomach. Each sister struggles with the unfamiliarity of being back together again. 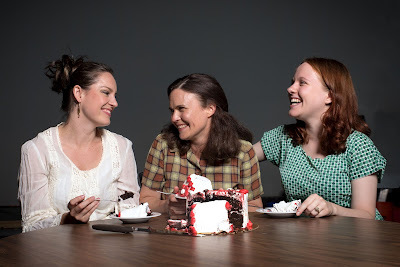 The play is the story of how these sisters escape the past to seize the future – with a telling that is true, touching, and consistently hilarious. Crimes of the Heart was written by Beth Henley. It premiered in 1979 at the Actors Theatre of Louisville, had a sold-out run Off-Broadway at Manhattan Theatre Club, and transferred to Broadway in November 1981. The play won the Pulitzer Prize for Drama in 1981. A movie version was released in 1986 starring Jessica Lange, Diane Keaton, and Sissy Spacek. Asheville Community Theatre’s production of Crimes of the Heart is directed by Eric Mills and stars a cast of 6 community members, 3 of whom are making their ACT Mainstage debuts! The Magrath sisters are played by Julianne Arnall (Lenny), Reeni Lindblom Dowd (Meg), and Sarah Billings (Babe). Alex Foote plays their cousin Chick, William Stamey plays Meg’s ex-boyfriend Doc, and David Dowd returns to the ACT stage as Babe’s lawyer Barnette. Opening Weekend features a deal on tickets – all adult, senior, and student tickets for all three Opening Weekend performances are only $18.00. Other Opening Weekend perks include complimentary champagne on Opening Night, complimentary chocolate on Saturday night, and a talk-back with the cast and crew after the Sunday matinee. For more information about Crimes of the Heart or about Asheville Community Theatre, please visit www.ashevilletheatre.org.